Pachypappa warshavensis forms loose leaf nest galls (see two pictures below) among leaves of white poplar (Populus alba), grey poplar (Populus canescens) or Euphrates poplar (Populus euphratica). The wingless fundatrix is reddish-brown with a body length of 3.5-4.0 mm. The offspring of the Pachypappa warshavensis fundatrix have a reddish brown abdomen - immatures are shown in the first picture below. They all develop into alates (see second picture below) with a body length of 3.0-3.2 mm. A distinguishing feature of the adult Pachypappa warshavensis is the absence of small hairs on the forewing membrane (cf. Pachypappa vesicalis which has small hairs on the membrane of its forewing). Also there are 4-6 secondary rhinaria with thick sclerotic rims on the third antennal segment, often confined to the distal half of that segment. 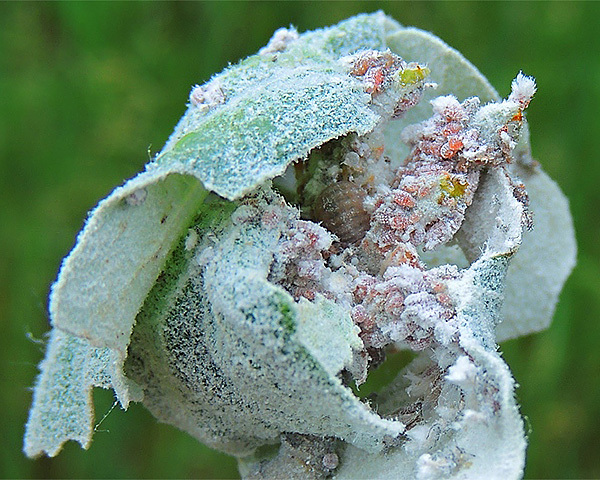 Feeding on poplar leaves is concentrated on the petioles, which causes the leavers to fold over, thus creating a leaf nest. 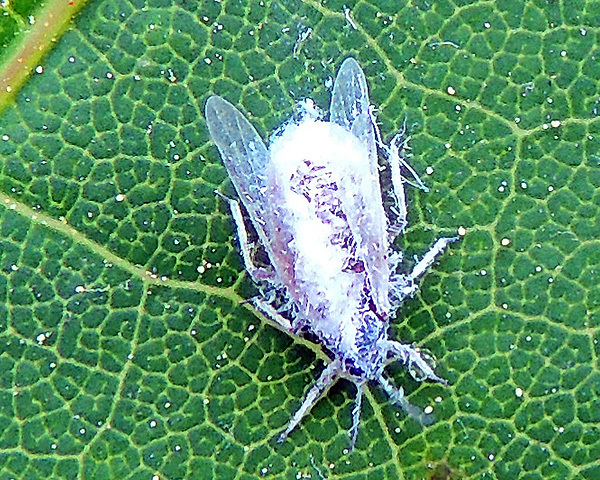 The alate Pachypappa warshavensis that develop in the leaf-nest are thought to migrate in June to the roots of poplar (Populus) and willow (Salix) species. Sexual forms return to poplar in autumn. Pachypappa warshavensis is found in Europe and central Asia. Pachypappa warshavensis has been recorded from 6 Populus species (Populus alba, Populus ×canadensis, Populus canescens, Populus euphratica, Populus ×hybrida, Populus pruinosa). 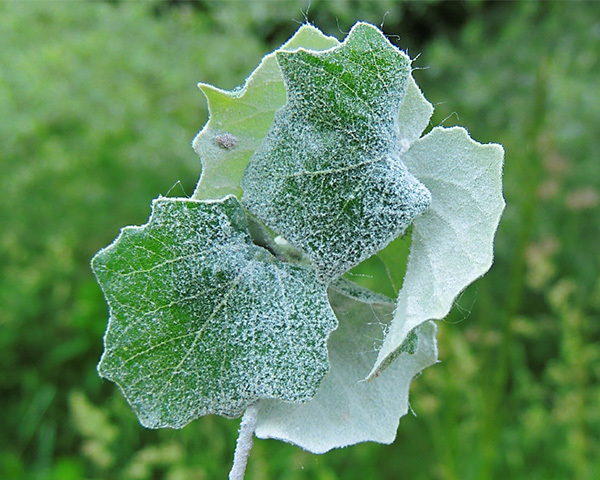 Blackman & Eastop list 18 species of aphid as feeding on white poplar (Populus alba) worldwide, and provide formal identification keys. Of those aphid species, Baker (2015) lists 8 as occurring in Britain: Chaitophorus leucomelas, Chaitophorus populeti, Chaitophorus populialbae, Pachypappa warshavensis, Phloeomyzus passerinii, Pterocomma populeum, Stomaphis longirostris, and Tuberolachnus salignus. Pachypappa warshavensis has been recorded from 2 Salix species (Salix caprea, Salix silesiaca). 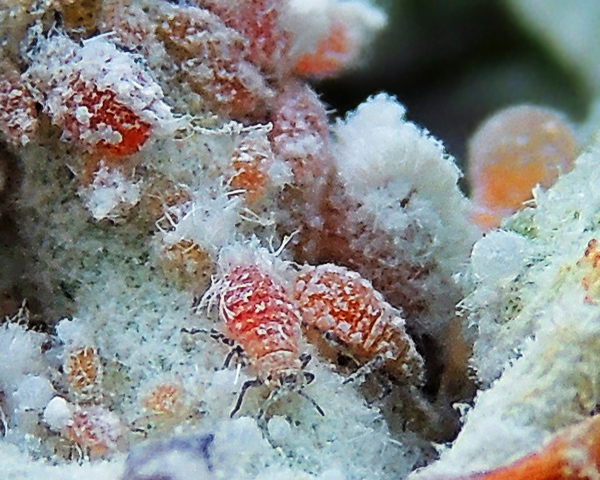 Blackman & Eastop list over 30 species of aphids as feeding on common sallow (Salix caprea) worldwide, and provides formal identification keys for aphids on Salix. Of those aphid species, Baker (2015) lists 24 as occurring in Britain: Aphis farinosa, Cavariella aegopodii, Cavariella archangelicae, Cavariella intermedia, Cavariella konoi, Cavariella pastinacae, Cavariella theobaldi, Chaitophorus capreae, Chaitophorus horii, Chaitophorus niger, Chaitophorus salicti, Chaitophorus salijaponicus niger, Chaitophorus truncatus, Chaitophorus vitellinae, Pachypappa warschavensis, Phylloxerina capreae, Plocamaphis flocculosa, Pterocomma jacksoni, Pterocomma konoi, Pterocomma pilosum, Pterocomma rufipes, Pterocomma salicis, Stomaphis longirostris and Tuberolachnus salignus.